This Made in the USA cotton blanket will be the fought-over star of the living room—and it’s built to last, too. 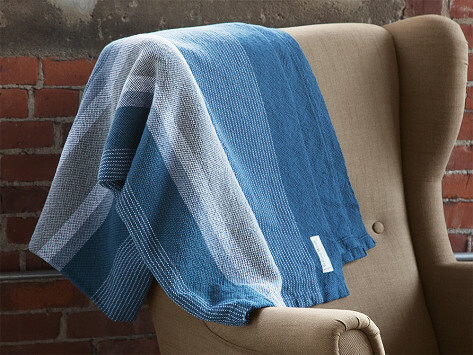 The classic design blends cotton and linen in one blanket, and is created on antique shuttle looms by dedicated artisans. The craftsmanship shines through on each sturdy-but-soft blanket, which is guaranteed to last a lifetime. Dimensions: 50" x 80" x 0.1"
Claudia Brahms and Noel Mount founded Brahms Mount, the renowned makers of these gorgeous Made in the USA cotton blankets. Back in 1983, they decided to revive Maine’s once-thriving textile industry, and set up their operation in a historic mill building. They believe in the craftmanship of weaving, so their signature blankets are created by dedicated artisans on antique shuttle looms dating from the 1800’s. The result is a classic finish that’s warm and durable—and backed with a lifetime guarantee. Cotton sourced from North Carolina is treated with eco-friendly dyes (or left au natural) and gives the blankets a sturdy feel that looks sophisticated. It’s pre-washed and pre-shrunk, too. 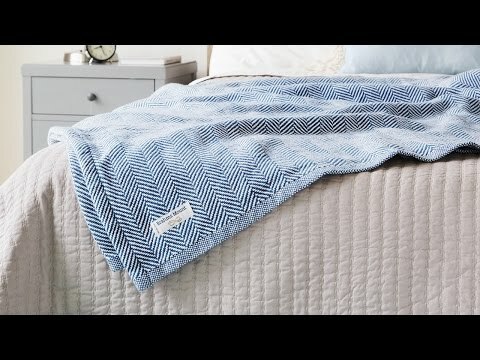 You can see the time and care that goes into each blanket, which is why one makes a great choice for a gift, or as a special touch for your own home.